The work on the house is finally finished. I walked around and around the house with a brush and paint looking for spots we'd missed. There were a few places here and there, and some touchup work around our front windows, but I can now say, remodeling on the house is officially complete. I took down the scaffolding, stowed the ladders and tossed the empty paint cans. 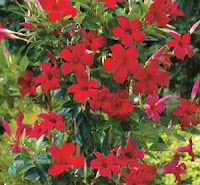 I went to the garden center and bought hanging baskets of Crimson Mandevilla to hang from the arbor. We've looked high and low for Jasmine, but we can't find the variety with the intoxicating fragrance. 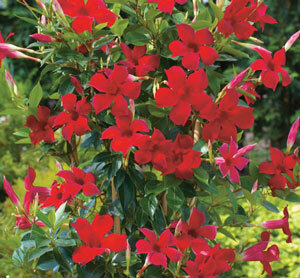 Jilda has talked about having an arbor and Jasmine for years, and we won't settle for anything less. I almost have the place in good enough shape to shoot a few photos. It's my intention to do that tomorrow. I bet you feel a sense of accomplishment on this one. One step at a time. One project at a time. Can't wait to see pictures. Now you're going to need another project. Why can I post to your blog but not Jilda's. Is this some secret thing I've ot figured out? 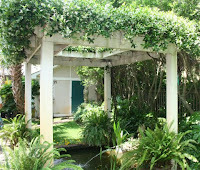 @ Old Kitty, that's not our arbor, it was just a graphic for the jasmine on an arbor. We're still looking for plants for ours. there are so many jasmines and they are all fragrant. our neighbors have yellow jasmine and the little bitty white star jasmine. they bloom at different times so the air is sweet. 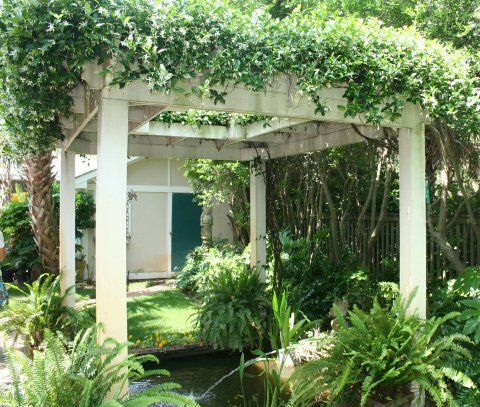 why don't you plant the arbor with different kinds that bloom at different times?